Find hotel near Beijing Ancient Observato ..
Beijing Ancient Observatory is a picturesque pre-telescopic observatory located in Beijing, China. Built in 1442 the Observatory gained a lot of popularity due to its iconic architecture and excellent design. The destination basically has two parts to it namely: The ancient astronomical instruments display hall and affiliated architecture. The attraction holds a lot of importance to China and the world for its historic value. Ask permission before taking photographs and video. Take the subway from Jianguomen. Take a bus from Beijing Railway Station East. How popular is Beijing Ancient Observatory? People normally club together Zhengyang Gate and Silk Street while planning their visit to Beijing Ancient Observatory. The ancient legacy of astronomy was most useful for new generation for learning of astrology and history. It was a best time to visit and gain more information about its. It is worth a visit anyway, it's not expensive, and if you enjoy science and cosmology this place is worth 5 stars. The history and equipment on show is first rate. It could take 2-3hrs to view it all. Good for everyone. This is an interesting place . You have to walk for a while but not so far. 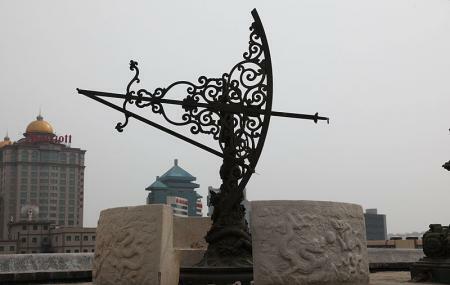 The Beijing Ancient Observatory, on the UNESCO Tentative List, is located on the top of a fort-like building at Jianguo Gate. It is one of the oldest observatories in the world. It used to be a part of the city wall once surrounding Beijing. Although there were no telescopes at this observatory, there were many sophisticated instruments for taking astronomical measurements, introduced in the 17th century from Western Europe. Here are eight bronze instruments constructed in the Qing dynasty. Six of them were built by the Flemish Jesuit Ferdinand Verbiest (1623–88) in 1669. The first was constructed by the Portuguese Jesuit Kilian Stumpf (1655–1720) between 1713 and 1715, while the maker of the latter is not clear. The seven instruments made by the two Jesuits are based on Tycho Brahe’s design but with Chinese decorations, while the last one belongs to the Chinese tradition but with a European system of graduation and sighting. Overall, the observatory is now the only example in the world that is equipped with Tychonic instruments. It's directly accessible from exit C of the Jianguomen metro station on line 1 or 2. The observatory houses the old astronomical equipment. The information sign is sparse on details. On clear days, this is a nice viewing area. There are 3 exhibition halls on the ground level have details on ancient time keeping instruments and constellation recordings. Only an hour is needed for the visit.